OOH! I gotta write that tutorial I've been promising! Thank you so much for your comments about how the wreath turned out! 1. Collect as many corks as you can find, and by that I mean literally ask for them from everyone you know! You'll need as many as you can get your hands on. 2. Buy a straw wreath (I bought one with a 14 inch diameter from Michaels) and leave the plastic on the wreath. You won't be taking it off. 3. Take a toothpick, put a dab of hot glue on one end of it, and stick it into one end of a cork. Then put a dab of glue on the other end of the toothpick and stick that end into the wreath. Start inside the wreath and go all the way around the circle like my picture shows below. 4. Make sure you put each toothpick in at an angle- *do not stick them straight into the wreath*. Don't be fooled by the number of corks in this picture. I also had an entire shoebox full off to the side :). 5. 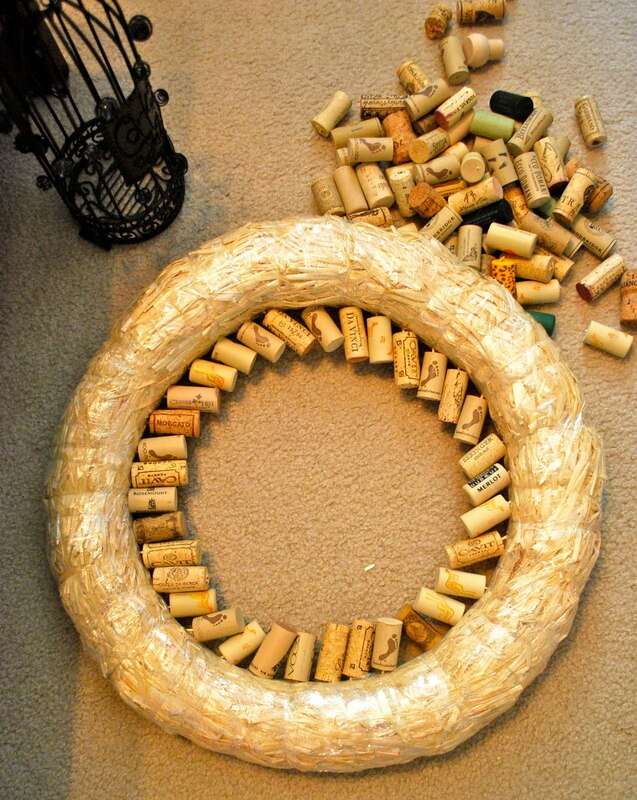 After you've finished the first circle layer and your wreath looks like mine above, begin building outwards by making another circle of corks, and another, until you've reached the outer edge of the wreath. 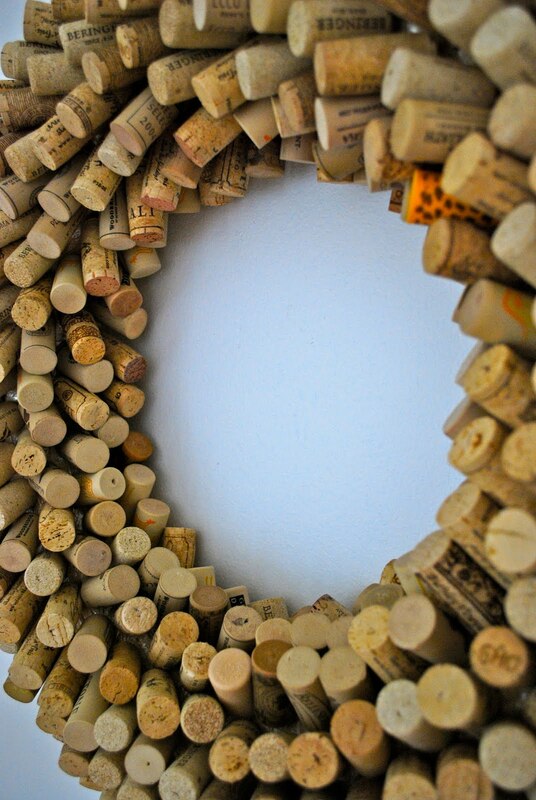 Make sure you angle all of the corks in the same direction as best you can. It took me 8 layers of circles to reach the outer side of the wreath. 6. Don't get discouraged if you think it doesn't look quite right as you're making it. Mine didn't really start looking like anything until the 5th layer of corks. So just keep going!! 7. Because then, before you know it, TA-DAAAA! You'll have created your very own masterpiece! I chose to use all natural colored corks, with the exception of one with a leopard print to add a little sparkle. But I'm sure it would look great with different colored corks as well! GREAT luck with your wreaths, and please let me know if you have any questions! P.S. To see my original post about my wreath, just click on the DIY label under this post! 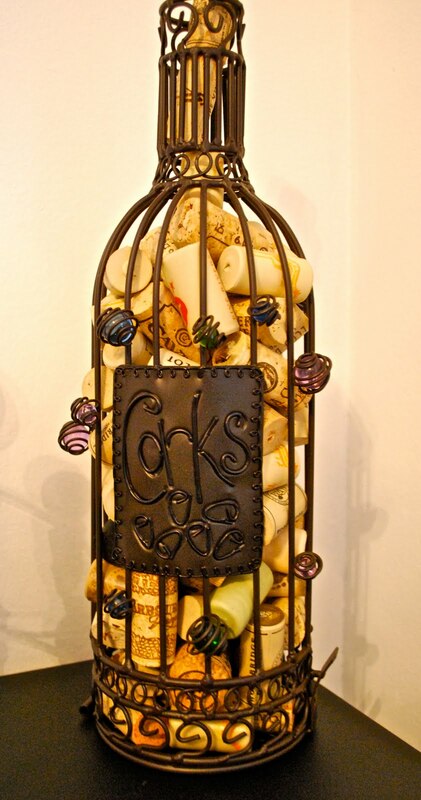 Very cute...I have been collecting corks too... just not certain what to do with them yet. I love your wreath! love love love!! if i only drank as much as you :)! that's awesome! i absolutely love it. thanks for the tutorial! stopping by from my backyard eden. this is amazing! Love how you arranged them on the wreath! I've been saving mine for a LONG time, but am going to need a few more to make this project! Hmmm - maybe I'll start with a glass right now! Thanks for sharing! This is just lovely! Great idea! Visiting from TGC, and I just LOVE this idea!! So unique! Sadly, I probably have enough corks to do two wreaths ;) Will have to give it a try soon! What a CUTE idea! I love it! Especially since it creates incentive to finish off a few bottles of vino! :) Thanks for visiting over at Ten June! I've been saving my wine corks for a long time. I'm definitely going to make one of these. It will look great for the fall! Stunning! I masterpiece wreath for sure. That turned out so lovely! I don't know how I could ever come up with that many corks. I wonder what else could be used yet come up with the same effect? I'll have to think on that for a while. Thanks for sharing ... I've posted a link. That is such a fun wreath! I love it and I think it turned out great!!! What a wreath! 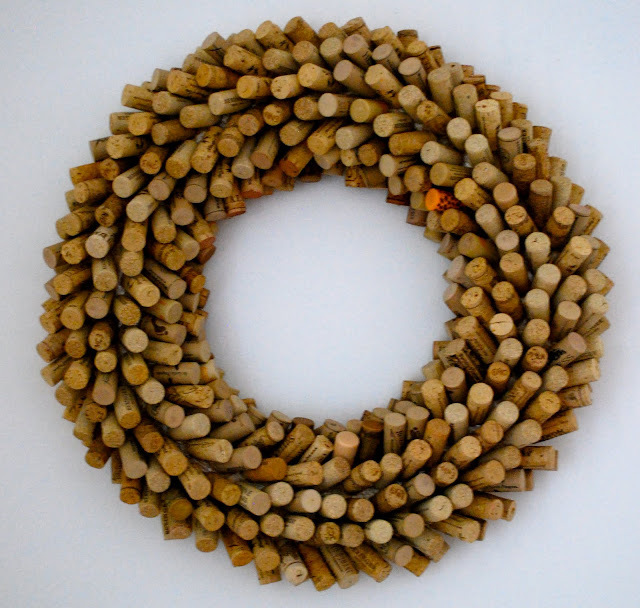 I also collect corks and would love to someday have enough to make a wreath like yours. Maybe I will ask my wino friends to start saving their corks for me! It would take me 10 more years to have enough on my own! Thanks for the great tutorial! The wreath looks fantastic! Nice tutorial, it doesn't sound too difficult. The only difficulty would be to collect that many corks. Awesome wreath, it looks fantastic. I just wanted to stop by and let you know that I linked to this post today from the new Home & Garden channel at Craft Gossip. :) My hope is to share many of the fabulous projects I see everyday with the vast CG audience. I hope you will not only stop by and subscribe to CG, but will tell your friends about the new category! Hope you see some traffic from it! I love this idea!! I have a ton of corks I have been saving and now I know exactly what I will be doing with them! The only problem is that I'll probably be drinking more wine after that because I know all my friends will want one too ;) Thanks so much for sharing your tutorial!! This wreath is incredible! I would love to link to it on my site AllFreeChristmasCrafts.com. I think readers would go crazy for this project. If this is something you'd be interested in, please contact me. My address is jlitz (at) primecp (dot) com. Thanks and have a great day!